Nautialqueva– Nautical Services, Lda. 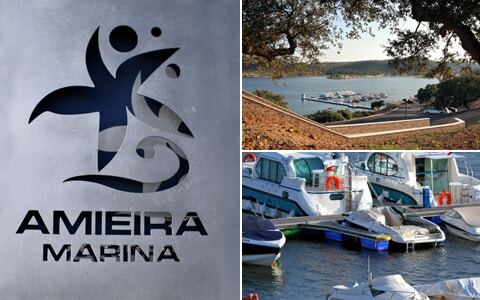 is the exclusive promoter of the Amieira Marina, the first nautical project in the Great Lake, implemented in the scope of the POAAP and that integrates all the nautical services from rental, maintenance and parking of boats, to a bar with terrace and panoramic restaurant, nautical article shop and convenience store. 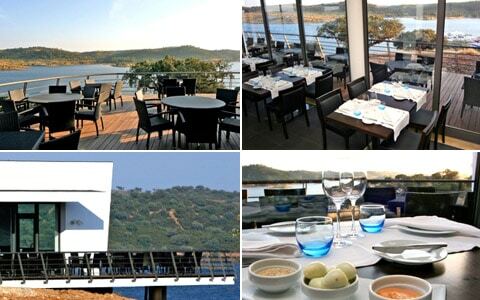 The Amieira Marina, company of nautical tourism and services in the Great Lake Alqueva, inaugurated on the 20th April its panoramic restaurant. The new space, with capacity for 120 people, bets in the traditional Alentejo food, by hands of the chef Lusa Lopes, former restaurant Bolota Castanha of Jlia Vinegar. The menu, mostly local gastronomy, begins with a couvert with several olive oils, followed by the starters like asparagus with eggs, fried mushrooms with olive oil and garlic, Iberian ham, smoked pork sausage, several preparations with vinegar among others. Dogfish soup, Alentejo tomato soup and Alentejo bread panada to prepare the stomach for the main course. Fish Dishes: Baked Cod fish, grilled Salmon with aromatic herbs, baked Octopus with potatoes and fried Dogfish with mash potatoes and bread. Meat Dishes: Stewed pork cheeks, grilled pork loin, pork with mashed asparagus, stew and lamb chops and duck with rice. We also have salads and pastas and the “Kids Menu”, for children until the 12 years old. Conventual pastry is the queen of desserts, but the nouvelle restaurant promises to develop the dessert options with more items from the Alentejo recipes. The wine chart exhibits preferential regional wines, especially “Ervideira” wines, a reference of quality, but without relinquishing other marks from Alentejo and of other regions to discover! With an average price between the 15 and 20 euros, the new space serves lunches daily, between 12h and 15h and suppers only on Fridays, Saturdays, Sundays, holidays and holiday eves, between 19h and 22h. Closed on Tuesdays. Group prices between 12,50€ and 25€ – contact us. Starting from vora or Beja follow the signs to Portel via IP2. Get off at the Portel exit and follow the signs to Alqueva/Moura, via N384 (do not enter the town of Portel,). Turn left at the sign for Amieira, via R255. At the roundabout follow the indication “acesso local” and Amieira Marina. 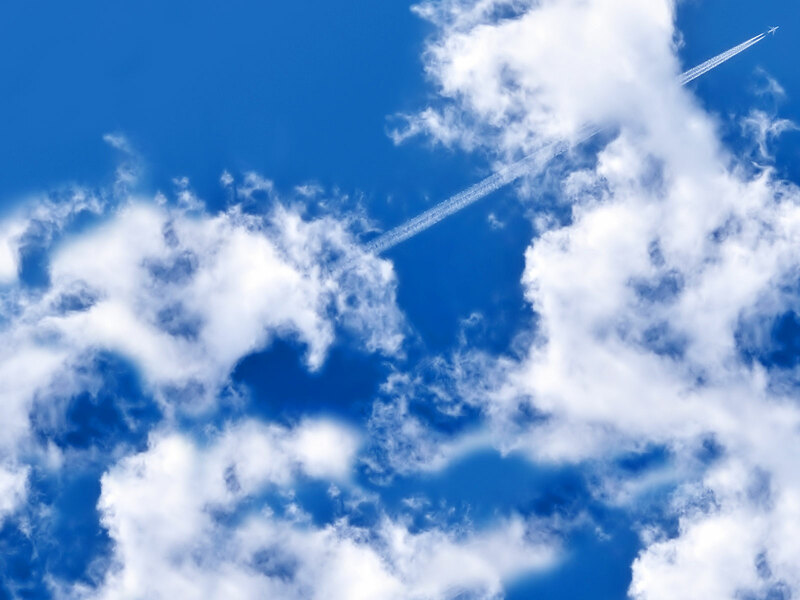 Hold the following links to see the recommended way. The growing use of the Great Lake for private vessels and the increment predicted, made it necessary to create safe and easy to use docking facilities for tying up.The Marina has an access ramp for putting boats in the water, as well as specific equipment, (hydraulic trailer), for safely dislocating boats of up to 15000 kgs. 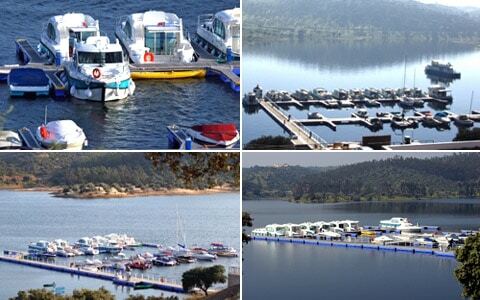 Thanks to the autonomy of these boats the users can navigate the Great Lake, in the authorised zones, docking easily and then visiting the nearby villages and other interesting areas either on foot or bicycle, benefiting of all the touristic potential of the region. Besides the bedrooms, sanitary installations and common living spaces, the houseboats have spaces for sunning, fishing and outdoor barbeques. There is no reason for monotony for the users of our houseboats. 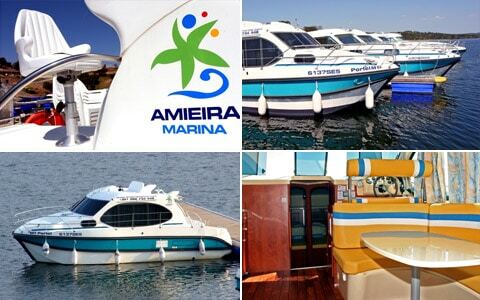 All the vessels are equipped with localization and safety equipment: Plotter, GPS and vertical sweeping sounds. The valorisation in terms of tourism of the “Lands of the Great Lake” is a strategy of the Tourism Region of vora and the national government. The characteristics of this dam, that includes the vales of the Guadiana and Degebe rivers and Alcarrache, Zebro e Lucefecit streams, offer real potential for tourist development, specially its proximity to the villages and towns of the Alentejo which could articulate their economic base to the tourist trade, rest and recreation of the large body of water of Alqueva and its margins. The development of what is known as alternative tourism is a far reaching reality in the worldwide innovation of the industry, which is manifested by the appearance of, products, spaces, equipment and services, commercial mechanisms and tourism promoting models that negate the global tendency of massification and that is based on the discovery of new environments and structures that offer a warm but original welcome, involving a personalised contact with the local populations and their cultural patrimony.